We’d love your help. Let us know what’s wrong with this preview of Healthy Five Ingredient Recipes by Hannie P. Scott. Healthy Recipes in 5 Ingredients or Less! Are you tired of complicated recipes with hard-to-find ingredients? Are you looking for delicious and easy recipes with only a few simple ingredients? Now you and your family can eat healthy meals with simple and delicious five ingredient recipes. Healthy and wholesome ingredients Easy to understand, step-by-step directions 50 hea Healthy Recipes in 5 Ingredients or Less! Book 2 of 5 in the Five Ingredient Cooking Series: Collect them all! Less is more because you will be spending less time shopping and cooking, and more time eating healthy foods with your family! This cookbook was created out of necessity. I was tired of searching far and wide for ingredients that I would only use once every six months. Who wants to spend all that time and money on complex recipes you will never even cook? That's what led me to create this cookbook full of step-by-step recipes that are easy to follow and simply prepared. Most importantly, they are healthy and your family will love them. All of the recipes only require 5 ingredients or less! Hannie P. Scott is a best-selling author that knows a thing or two about cooking! Cooking and experimenting with foods is her life passion. Driven by her desire for cooking for others (and herself), Hannie spends a lot of time in the kitchen. She enjoys sharing her love of food with the world by creating "no-nonsense" recipe books that anyone can use. To ask other readers questions about Healthy Five Ingredient Recipes, please sign up. I like to know if she going make one Bars and desserts healthy smoothies?? 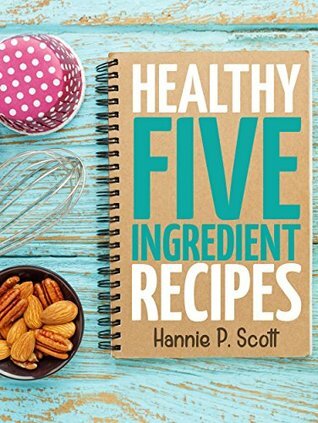 This is great book Love the recipes do she have more book like this healthy five ingredients recipes ? This is one of the best cookbooks I’ve seen in a while. I love that there are only 5 ingredients or less and just a few simple steps. At the beginning of the book there is a list of abbreviations, conversions, and an introduction. All the recipes sound good. Book starts out with an introduction, free gift, table of contents and table of abbreviations used for measuring. Listing of other books the author has written are listed. Each recipe starts out with a title, servings and ingredients which you should be able to substitute for a healthy choice for your dietary needs: low fat, low sodium, etc. Most are fresh ingredients on the low side of sodium already. There are directions in how to make. There is no pictures and no nutritional information but the ideas and recipes are awesome. What I like about this book are the fresh ingredients that are healthy on their own and how to make them into snacks. For places where it calls for beans I'd make them myself from soaking overnight rather than from a can. Love taco seasoning mix as I have all the ingredients and needed to replenish ours on the shelf as we use it on our chicken when we roast. Zucchini fritters and peanut butter energy bars which we'e made a bit different sound like ones I'll be trying this week. Can't screw up 5 ingredients lol. I'm Really Looking forward to trying all of them over the next few weeks. Thank you! This book has simple recipes that sound delicious. The Tex mex eggs, spinach macaroni and cheese, sweet potato eggs, deviled eggs with humus just to name a few. Check this book out you will not be disappointed.